Golden Apples: Still Not Finished..
Or rather, finished (all the ends woven in) but still not done (knitting). Finally-- the foot is long enough (longer for some reason than average by a half inch!) and I am about to start the toe. There will be one yarn end per toe to weave in—but it hardly counts. I plan in doing dead simple flat toes, with a grafted finish to the toe, and the last bit of yarn end will already be threaded (and neatly woven in) as the graft is complete. Yesterday was great fun—It was just the 4 of us—Jessica, Nancy, Debbie and myself—but that didn't stop us from having a wonderful time. Slowly the knitting group is growing. Any day now, everyone will show up on a single sunday, and we will take over the conference table. The plan for today is to finish up the toes... And immediately start on a simple pair of socks. Some nice bright color—and self patterning yarn—something cheerful. Black is a practical color--(well especially for a Ny'er.) But it's dreary to knit and hard on the eyes. I have some lovely home dyed yarns—but I want simple—and I have some plans for some lace socks (with—you guessed it—a leafy motif lace!) and some plans for stranded color work socks. But I want something I can knit with out thought, and fly through! A bit of fancy work at the cuff--maybe something as simple as a contrasting stripe or two, and then generic socks--fast and furious. I have already chosen the yarn (one of my sock club sock bags) but you'll have to wait till tomorrow to see which one. (and a few more skeins of yarn will be balled up, --and one divided. Next month (next week!) 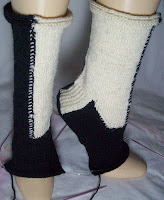 I will be knitting up an other pair of secret socks--as well as March's sock--Or at least, I plan to!